I'm trying to get a cell C3 to highlight using conditional formatting, but based on a value in 4 other cells. If 4 continuously adjacent cells (e.g. AS3, AT3, AU3, AV3) contain the X value only then do I want the cell C3 to highlight, so NOT if they are not joined together. (It's a worksheet to highlight absences, 4 times in a row). You will need to use a formula in the conditional formatting to check the cells are all containing X (assuming that is the value you are checking for). 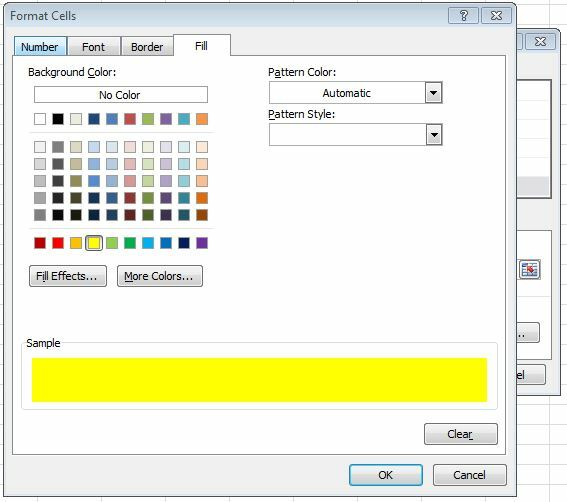 Choose NEW RULE from the Conditional Formatting menu. Choose "Use formula to determine which cells to format". 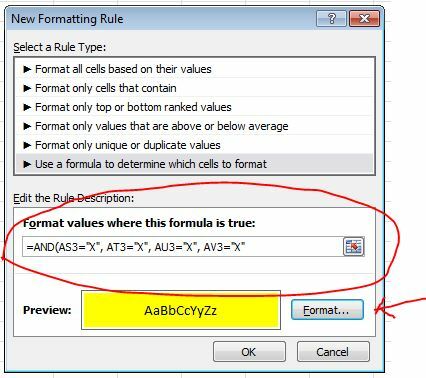 In the box for "Format values where this formula is true:" enter the formula needed. (I've given an example below). Click the Format... button and select the formatting you desire. Click OK twice to save it. Test it by entering "X" in the cells. Not the answer you're looking for? Browse other questions tagged microsoft-excel microsoft-excel-2010 microsoft-excel-2007 worksheet-function or ask your own question.